MSG is the file extension for the Microsoft Exchange mail document. As part of the Microsoft Servers line of server products, the MSG file format is widely used by all Microsoft infrastructure solutions. An MSG file identifies mail messages formed by the email programs Outlook Express and Microsoft Outlook. Just like the techniques used by Word, Excel, and other similar programs, MSG files are also saved as COM structured storage OLE2 compound documents. An MSG file consists of several streams, each with subtags. Each subtag contains a certain piece of information with eight digit codes. The first four digits describe the kind of information the subtag contains - such as nameid, attachment, recipient, sender, body of message, etc. The second four digits describe the kind of encoding used. An MSG file may be encoded in either binary or ASCII. The main features of an MSG file are the main message body, calendar, contacts, reminders, etc. These are all arranged in a hierarchal directory with files and folders. Support for mobile and web-based access to information and support for data storage are MSG's other features. MSG files can also be sent over the internet. Besides Outlook Express, MSG files can be opened by any program that supports MAPI (Microsoft's "Messaging Application Programming Interface"), which include Priasoft MSG File Viewer and Assessor, and Encryptomatic MsgViewer Pro. 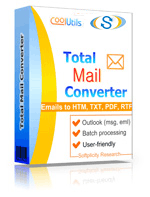 To convert .MSG to PDF, HTML, TXT or other formats use Total Mail Converter.